AND THE 2 LUCKY RANDOMLY DRAWN WINNERS ARE………. A BIG CONGRATS LADIES !! AMAZING ROJECTS! Please email me at nicolle@creativeembellishments.com to claim your vouchers. Hello CE friends!! September is our Birthday month. We are 4!! Holy cow time just flies. It’s been a cool 4 years so far. Our fans totally rock and we would not be here without you. Thank you so very much from the bottom of our hearts. Big warm squishy hugs. The challenge is to be inspired by one element from the photo below and the twist to use a stamp on the the background of your project. >Create a NEW project layout, mini album, tag, card, canvas, etc….as of September 1st, 2017. Now onto our teams amazing reveal. Hello! This is Marci. I know School is just about to start or for some HAS started. I have created a layout of my grandsons LAST DAY of school in June: the inspiration just called me to this photo! I used: Schools Out for summer: I used a navy Sharpie and used Tim Holtz Mustard Seed Distress Paint, Distressed # Stamp: I used Navy ink around the edges and photo. School Set: I used various colors, stickles on the pencil and glossy accents to highlight. Hope you can join us in this monthly challenge! Hello Creative Embellishments friends! Maggi here with my inspiration for this month’s challenge. . I was inspired by the artsy look of the inspiration photo and of course the numbers remind me of back to school time, so I made an journal to gift to a young budding artist. I thought she might have fun with it going back to school. For the twist, I used Creative Embellishments’ Distressed Brick Stamp on the background of the cover. I also used the Metal Stencil to mask behind the easel from the Artist Create Collection. 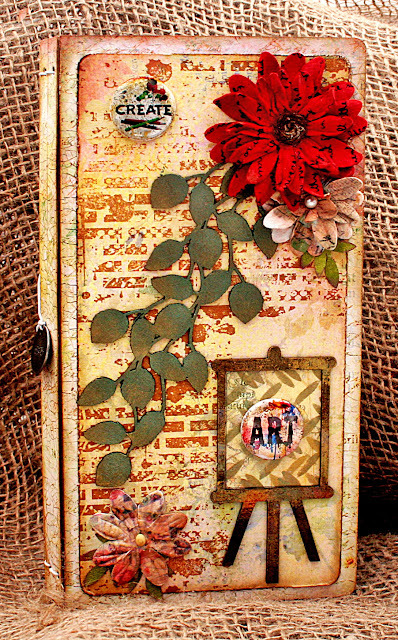 I used Prima Metallique waxes to color the easel and then selected two flair buttons from the Art Flair Set and dabbled them with alcohol ink to give them a more vintage vibe. Finally, I added the Rose Leave Spray down the center topped with a couple of flowers. You can view a video flip through of the journal if you want to see the inside. Happy Happy September already. I want to share a fun set of ATC’s I made from this awesome inspirational picture this month. I loved all the letters and the colours of the mood board so I totally went with that. I used a ton of stamping in this project, layers and layers of stamping with all of my favorite stamps, you can watch the video here. After using the Numbers, Burlap, Harlequin stamps to name a few, I the used the Binary to stamp on top of the Bubbles Chipboard for some extra effects, and then put it all together with some inspirational words from stamps from my stash. I hope this inspires you all to play along this month. It’s hard to believe that we are September 1st already. I hope that by now you’ve had the chance to try the Creative Embellishments Large Tags. They are so fun to play with and offer so many possibilities. On this one I started by covering the tag with a beautiful background paper. Then I did some stenciling and some stamping with one of my favorite stamps, the Distress Text Stamp. The last element are the amazing Large Gear Set Black. Once you assembled all your elements, then you start layering, playing with tags, twine and text papers. The final touch is splashes of white gesso. I hope you will join us on this challenge and can’t wait to see your projects. September is here already! I wanted to share the layout I created for this months inspiration picture! For the Twist I used the Distressed Corner Stamp! I used lots of Prima Art Alchemy paints on the grunge stars, Grunge Star Corner, Washi Tape Clusters, and Honor Student Title piece. I wanted to keep with the grungy feel so embossed the grunge arrow with black embossing powder then inked the rest of the chipboard pieces with lots of black ink. I added some School Flair and the layout was finished! I am looking forward to seeing your creations for this months challenge! I was inspired by some of the diagonal elements in this month’s Creative Embellishments challenge picture to angle the elements on my page. I was also encouraged to go outside of my typical comfort zone by stamping on the background of my page. I found a great subtle background stamp — the Distressed Grid stamp — and inked it with grey chalk ink to add a little interest in the background of my page. I used Creative Embellishments Basic Alphabet chipboard to make my title. I layered two different colors of blue ink to get just the right color for this page. I was inspired by some of the colours, letters and #’s and was drawn to the back to school idea. I used one of my very own Creative Inspiration sketches to start the background paper strips and circle. I used 2 different Creative Embellishment stamps – Distressed Number Stamp, Binary Stamp and then used this amazing Alphabet Frame chippie set with crayons, glue and eraser along with the fabulous Adventure Word Set for Titles. I copic coloured them. I finished this off with some brads and it’s all done with a great first day back to school photo. Hi Everyone and Happy September! I had so much created with the inspiration photo this month and went with a super large tag! I started with one of the large tags and covered with papers first…than I used the distressed text stamp in the background. I added in a Circle Doodle Frame and finished it all off with a flair from the #1 Dad Flair Set. Have fun playing along and I can not wait to see what you make!!!!!!!! This challenge inspired me not to stamp on my background papers, but to stamp on my chipboard piece with a background stamp instead. I stamped with blank ink and a script stamp to give the beautiful Steampunk Clock and Gear Cluster something extra. I was inspired by the bold colours and the steampunk/vintage feel to the image. I can’t wait to see your entries too! Happy September! It’s my favourite time of year – the weather is crisp and cooling off and the kids are going back to school – a time full of possibilities! All the numbers on the inspiration photo were the perfect inspiration for this Six Impossible Things page for my Alice in Wonderland Art Journal. I started the background by using the CE Distressed Checkers Stencil – I used a sponge and some Black Archival Ink and randomly added stencilling across the page. I also used the Black Archival Ink with one of the CE Halftone Circle Stamps to do some background stamping (for this challenge’s twist). I added some stencilled clocks using Prima Art Extravagance Copper Crackle Paste. I cut the image of Alice and the White Queen from an Alice in Wonderland Puzzle Book I found and then used Lindy’s Stamp Gang Mists to blend the scene from the image into the page. Finally, I painted the I-VI (for the 6 impossible things) of the Grunge Roman Numerals chipboard using Prima Art Alchemy Metallique in Acrylic Paing in Brass Hardware. Link your project below to be 1 of the 2 lucky winners this month. I would love to join but dont have much time for september. Maybe when october hits, it will be my little girls last kid birthday before she is a teen. Thanks Karen! Glad you enjoyed and also glad you will be back! Thanks again for joining us! Happy Birthday (month) Anna! looking forward to you joining in!